-Aerating by pouring a wine into a traditional decanter bottle requires 30 minutes to 1 hour to achieve the full effect. -Vineara accelerates aeration through a patented air injection process and dispenses fully aerated wine directly from bottle to glass with the touch of a button. -Vinaera is the world's first electronic wine & spirit aerator. It has the capacity to dispense fully aerated wine or spirits at 1 ounce（28.5ml）every 2 seconds. -Due to the pneumatic operating method, the exposure of the wine to bubble surface is 6 times greater with the Vinaera product than a funnel style aerator. -The patented design of Vinaera injects air into the stream of wine pushed from the bottle through the dispenser spout. -This air injection more effectively and quickly releases the flavors and aromas of wine, and helps oxidize and soften the natural tannins in wine. -For spirits, the oxidation through large surface exposure to bubbles releases fusel alcohols and make the spirit less "spicy" and bitter. 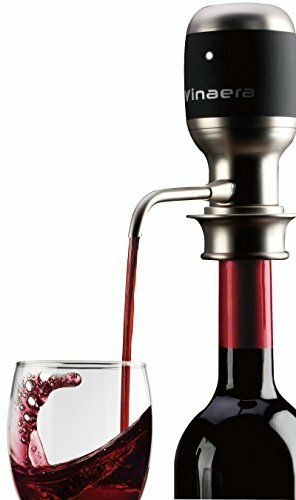 -This instant aeration lets you enjoy the full bouquet of your wine from the first glass without the long wait of traditional decanting. Operating Requirements: Spout to table-top provides more than 26 cm clearance for the largest wine glass. Powered by 6xAAA 1.5V batteries, you can aerate and dispense to your glass more than 250 750ml bottles. (Batteries not included) The Vinaera body can be used with most common wine bottle shapes, and the tube length is optimized for standard 750ml wine bottles. 2014 reddot best of the best awards,global patented design,it provides 6 times more air contact surface oxidation than a gravity injected funnel type aerator, aerates 30-40 minutes earlier than a glass decanter. It is the fastest wine aerator we have ever seen. Built-in electronic air pressure system, powered by 6xAAA batteries(not included), you only need to put the device into the bottle,and one-touch operate the aerator, then it will dispense fully aerated wine at 1 ounce (28.5ml) every 2 seconds. It delivers you a supreme enjoyment on your home bar counter. Spirit can also be softened by Vinaera aerator, the oxidation through large surface exposure to bubbles releases fusel alcohols and make the spirit less "spicy" and bitter. The most clean and great idea on the table: Directly into the wine glass, no need to pour out and into, no else decanter required,it is so simple, but much benefits from the creation by Vinaera. RoHS, CE Certified food safe, be assured to get the mellow, flavored wine. If you have any questions about this product by Vinaera by Viotek, contact us by completing and submitting the form below. If you are looking for a specif part number, please include it with your message.